Description: Nady PCM-200 Microphone - 60 Hz to 16 kHz -54 dB - Dynamic - Handheld - XLRCongratulations on purchasing a Nady PCM Microphone. These vintage retro-look styling microphones have advanced state-of-the-art acoustic design - perfect for multi-purpose studio, recording, broadcasting, or live performance theater, concert applications. Description: The Cobra MR HH125 Handheld VHF Radio is the perfect size for recreational boaters or for use as a backup. 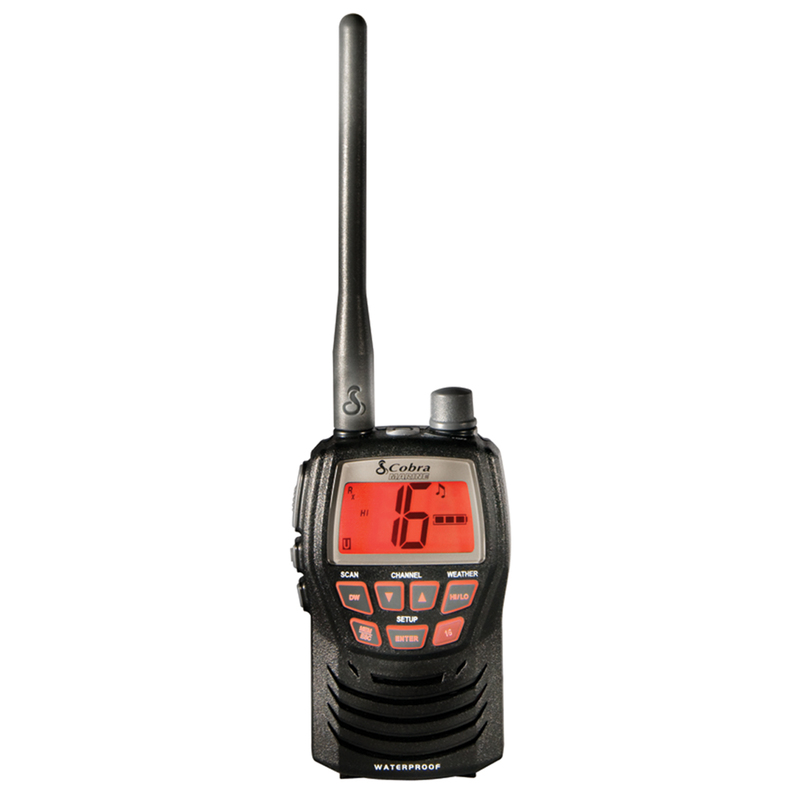 Waterproof to JIS-4 standards, this radio offers a large illuminated LCD display and keypad for use in low light. Features all NOAA weather channels, weather alert, and all US, Canadian, and International channels. Selectable 1 or 3-watt output. A noise-cancelling microphone with controls on the Cobra MR HH125 radio eliminates ambient noise and allows instant access to channels 16 and 9. Memory scan finds ongoing conversations on channels programmed into the memory. Button/key lock will lock function buttons and keys to prevent accidental change to the settings. The MR HH125 comes with long-lasting rechargeable NiMH batteries that won't develop a memory when charging. It can also be used with 5 standard AAA batteries (not included) in an emergency. Cobra MR HH125 VHF radio features battery saver circuitry that extends the life of the batteries. Also comes with 12V accessory charger, spring-loaded belt clip, and wrist strap. One-year warranty. Description: The stylish, stainless steel TWINSHARP Duo sharpener has two stages to breath life into any knife. The course (I) stage will restore the dullest knives and the fine (II) stage has ceramic wheels that will sharpen, smooth, and polish the edge. This sharpener is extremely easy and quick to use. A perfect compliment to any TWIN series knives. 30 degree sharpening angle.The stylish, stainless steel TWINSHARP Duo sharpener has two stages to breath life into any knife. The course (I) stage will restore the dullest knives and the fine (II) stage has ceramic wheels that will sharpen, smooth, and polish the edge. This sharpener is extremely easy and quick to use. A perfect compliment to any TWIN series knives. 30 degree sharpening angle.